This soup is very similar to the Zuppa Toscana we love. Instead of potatoes, cannellini beans are used. I wouldn't recommend using canned beans for this recipe if you want to use your slow cooker. However if you want to make this soup on the stovetop, feel free to use canned and just cook it until everything's warmed through. I will say if you go the stovetop route, you won't get the same depth of flavors that slow cooking imparts. For the sausage, you can add it a variety of ways. I cooked the sausage, cut it in rounds and then added it to the soup. We like the bite and texture it gives to the soup. But another alternative is to remove the sausage from the casings and sauté in a pan before adding to the soup. By doing this, you'll have meaty flavor sprinkled throughout the soup. Lastly, the kale is added fresh just before serving. Since the kale is sliced so thinly, it takes no time at all to cook through just from the heat of the soup. Add as little or as much as you'd like as you ladle the soups into bowls and don't forget that touch of Parmesan cheese and drizzle of olive oil to complete the dish. This is perfect with some good crusty bread to sop up that flavorful broth! Meanwhile, cook the Italian sausage. Heat a pan to a medium temperature. Add 1/2 cup of water and place links in pan. Cover, heat for 10 minutes, turning links once. Remove cover and continue cooking for 10 minutes. Remove sausage from pan and allow to cool until able to handle. Once cooled, cut into rounds and add to the slow cooker. Heat oil over medium heat until shimmering. Add pancetta/bacon and cook until lightly browned and crisp. Stir in onions, garlic and red pepper flakes and cook until onions are softened and lightly browned. Stir in 1 cup of broth , scraping up any browned bits and transfer to slow cooker. Stir in remaining 2 cups broth, water, soaked beans, bay leaves, and Italian seasoning. Stir to incorporate all ingredients, cover and cook until beans are tender, about 9-11 hours on low or 5-7 hours on high. 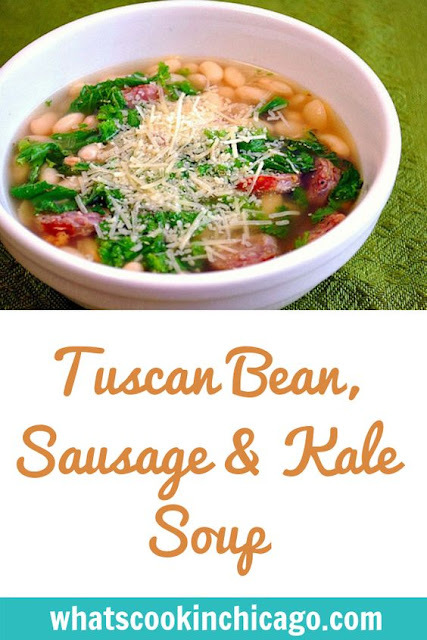 Season with salt and pepper to taste and to serve, ladle soup into bowls, top with 1/4 cup of kale, a sprinkling of grated Parmesan cheese, and a drizzle of olive oil if desired. Thanks for sharing. 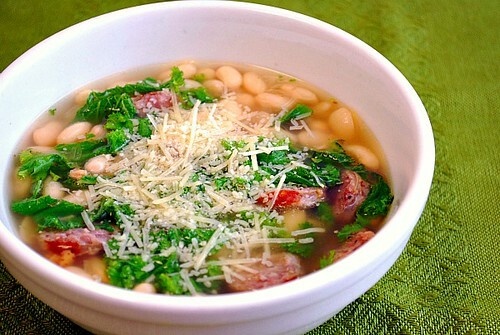 I have a bunch of dried beans just waiting to be used in this delicious soup. Sounds so good right now! I make a variation on this soup, and it's one of our favorites. I wonder if vegetarian sausage would survive that long in a slow cooker, or if it would just dry out. Any idea? It says to add onions, but there are no onions listed in the ingredients. Anyone know how much onions to add? AmyL - I've updated with the onion - sorry about that!